13:20 an eagle flew by from the left and back. 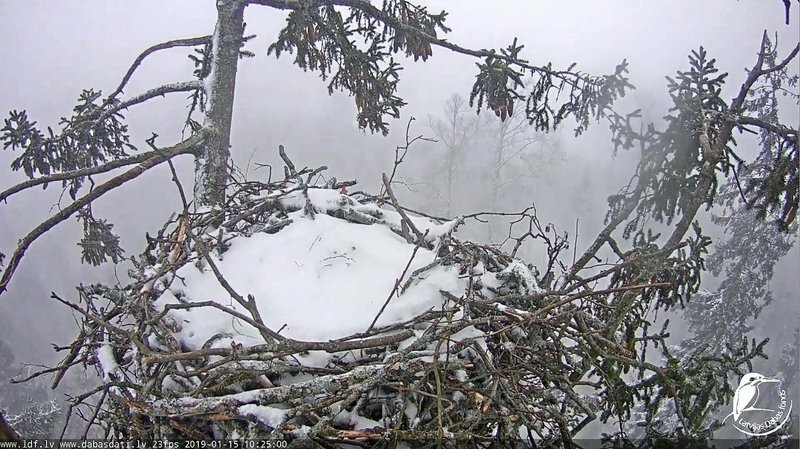 it had a stick then it landed on the back branch below the nest. strange. 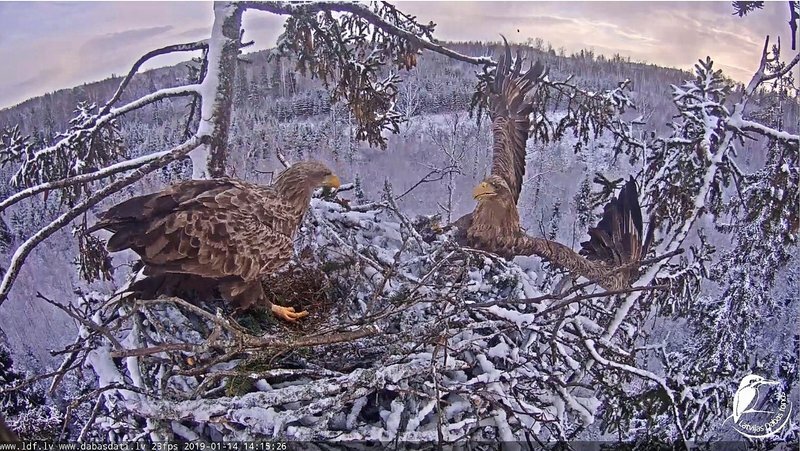 13:53 Milda brought a stick. this time Raimis only ducked (hunched down his shoulders) when he saw Milda coming. 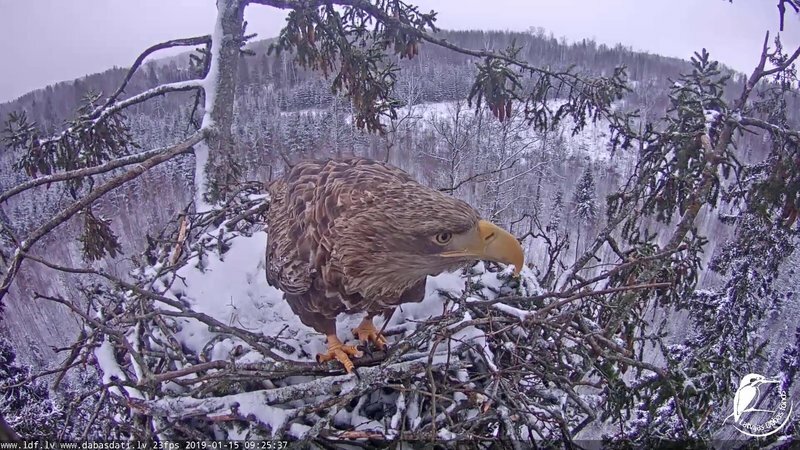 13:56 Milda went to the top branch. Raimis yawned. 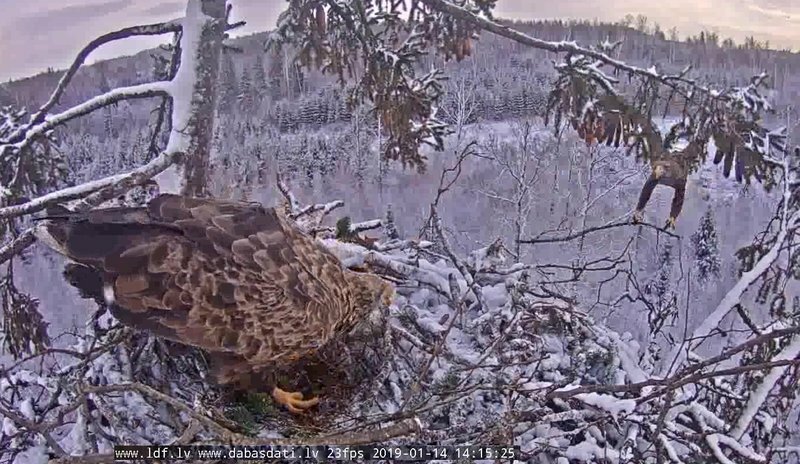 14:05 Raimis turned around on his branch and came back to the nest. 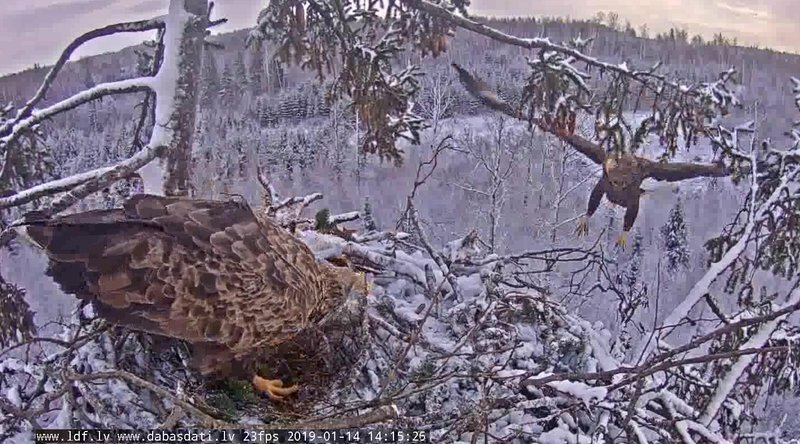 14:08 Raimis jumped to the right branch and began gnawing it. 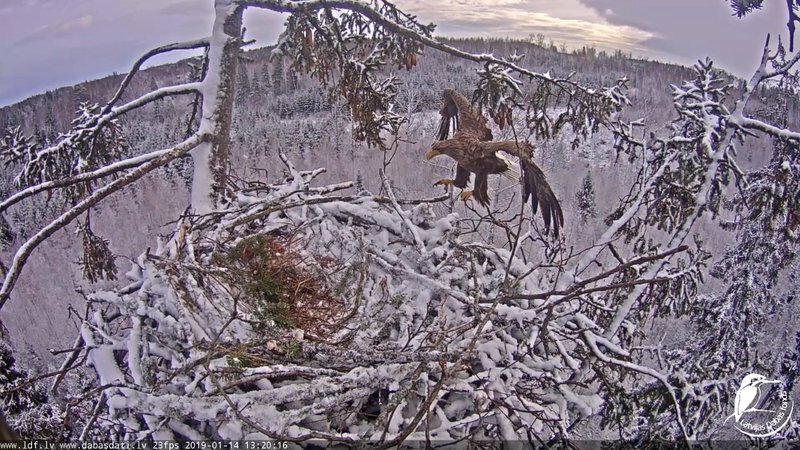 14:10 he jumped back to the nest. 14:15 Milda had an accident, too heavy stick perhaps. 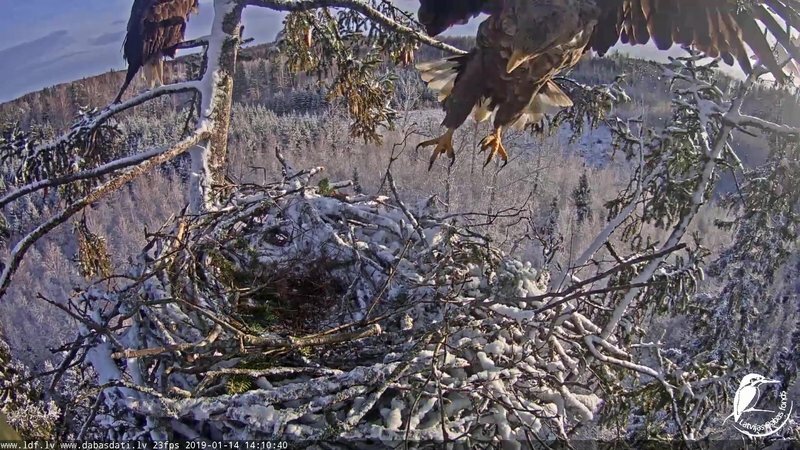 she collided with the back side of the nest on landing, just like Durbertina once. 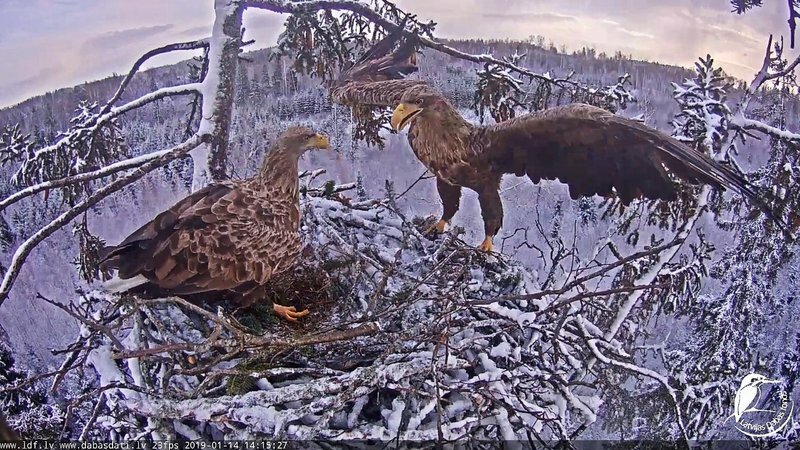 how embarrassing for an adult eagle! she dropped the stick when she crawled in. - no! 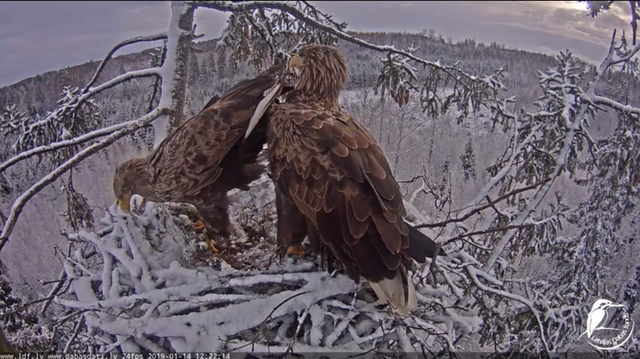 actually she dropped the stick before she touched the nest. 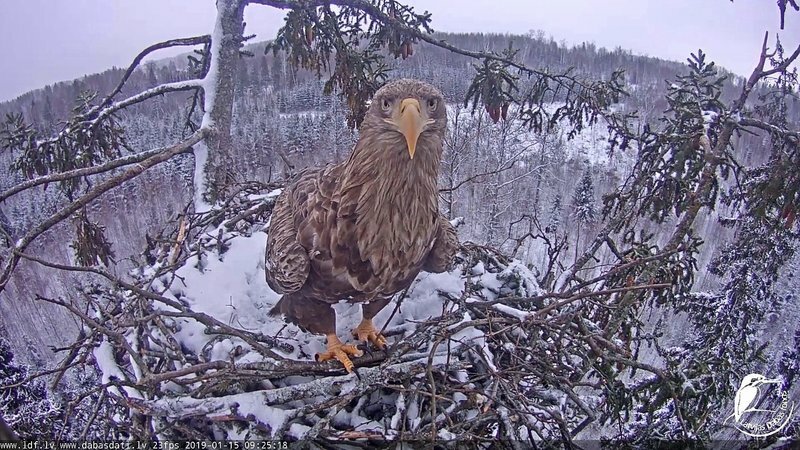 she saw that disaster was approaching and she needed her talons for getting a grip on the nest. i made two pictures, two consecutive frames. 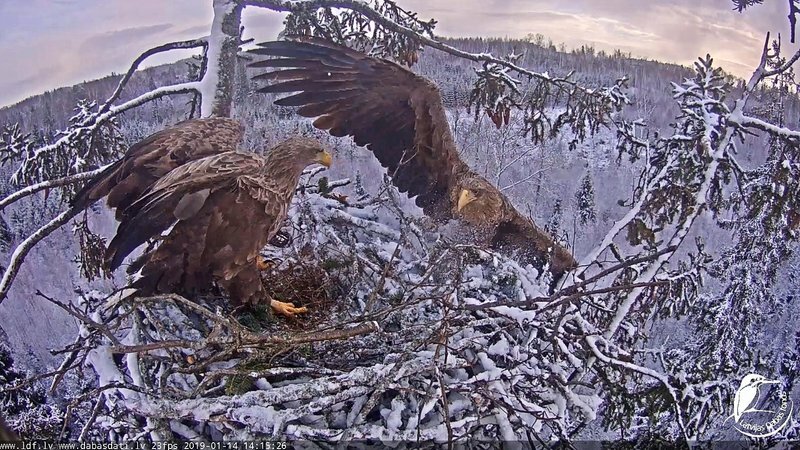 14:26 (nearly) Milda flew out. 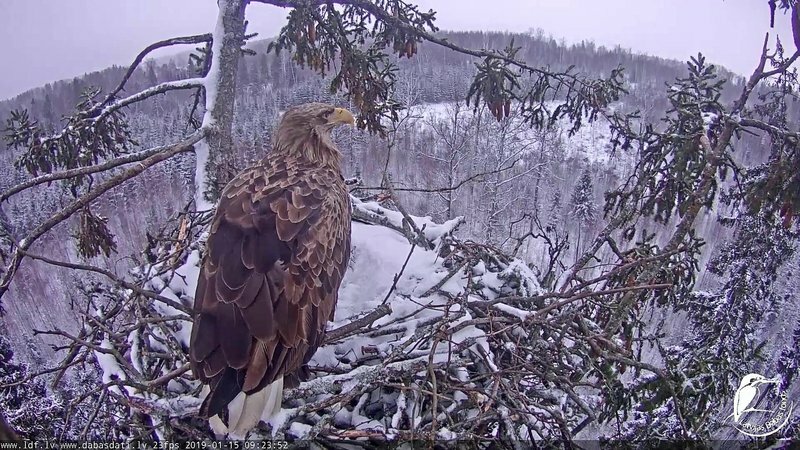 13:21 Milda returned with her stick. she started working with it... soon she'll drop it if she don't be more careful. When they lose branches, they don't worry. But throw the wrong branch can not. They work with what they have. 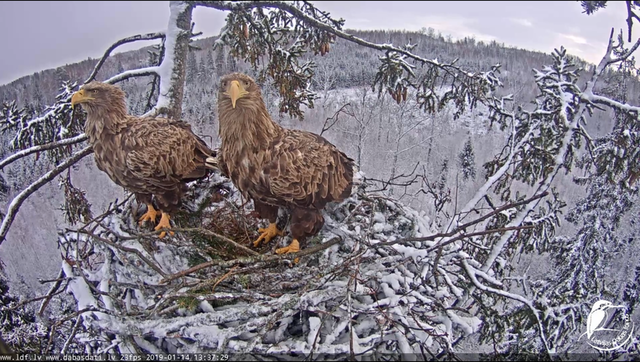 At 13: 30, I thought Raimis would have his eyes gouged out with those twigs. Vērotāja considers that crash landing is connected with wind gusts. 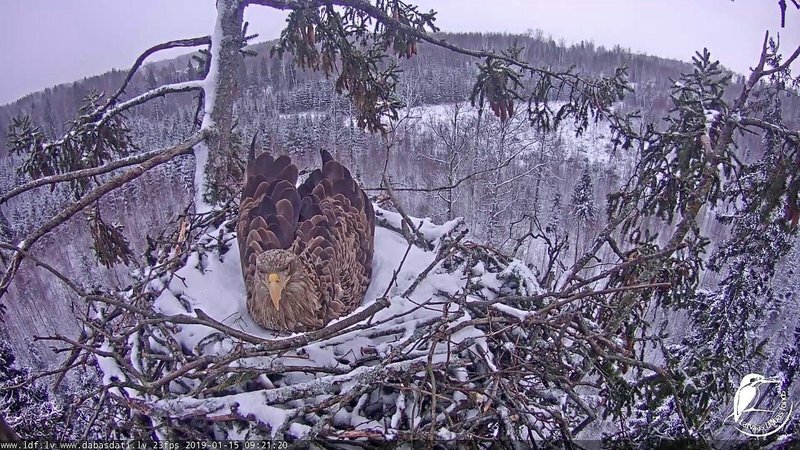 Milda sat under a nest two minutes, waited when wind abates. I reconsidered attentively these moments and I think that indeed. Thanks for a photo of the lost stick! I admired too! 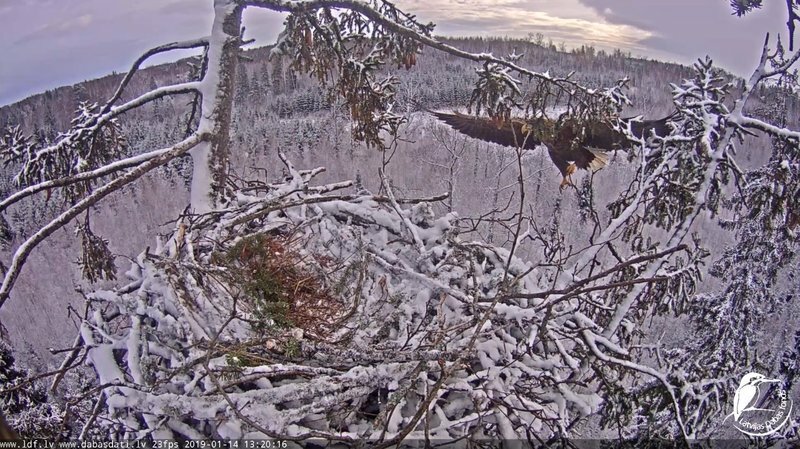 The nest very sharply changed after eagles flew away. Liz01, thanks for cheerful photos! Good evening. I would like to thank all diligent commentators for the daily reports, videos and photos. You are just great. Unfortunately, I have too little time to actively participate, but I look into the forums and the nests as often as possible. 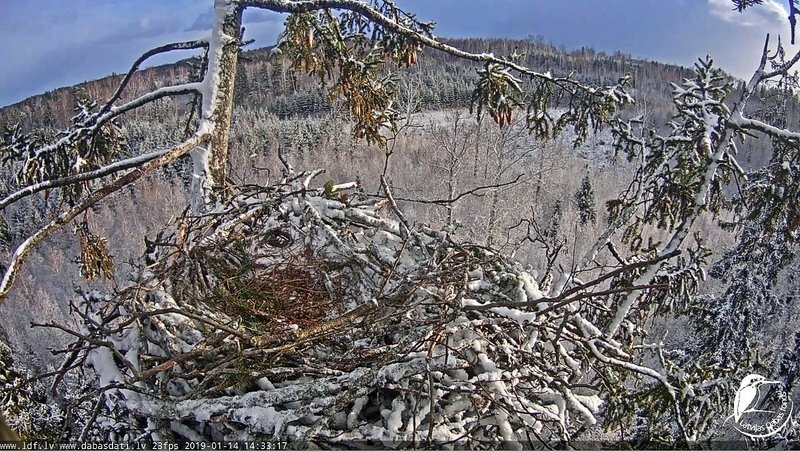 Even out of season, it is very interesting to follow the events in the nests. Der Mensch braucht die Natur, die Natur den Menschen nicht. Der Mensch ist Teil der Natur, er ist ihr nicht übergeordnet. Erst wenn er das begreift, hat er eine Überlebenschance. 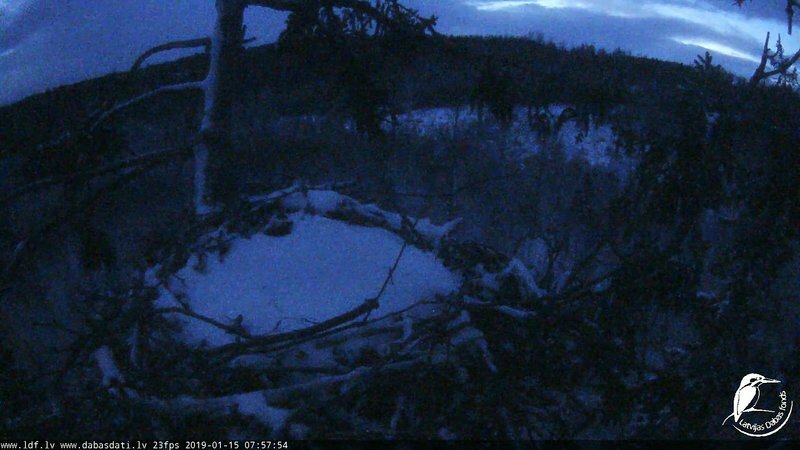 07:45 Nest was already visible, the bowl is still white. It has snowed again. Nice that finally winter is here. 9:25 She is looking for someone? Milda is here! she arrived so quietly that i didn't hear it. i was watching yesterday's video of he crash landing. that was noisier. i also watched again her stick delivery in two phases. 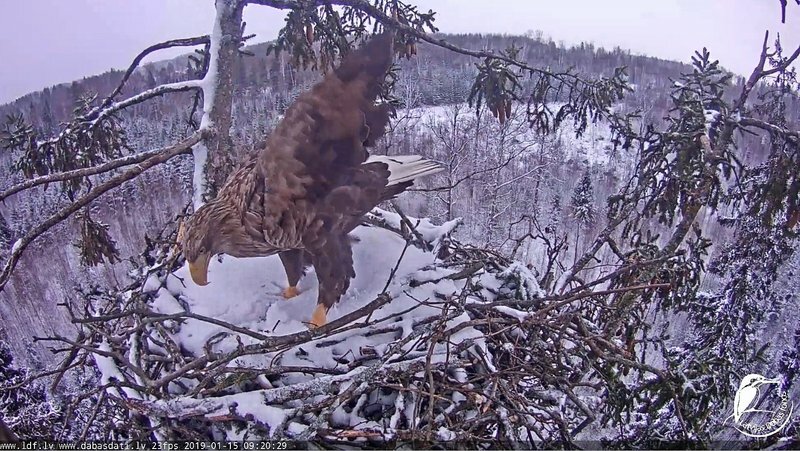 i made one video containing her flying to the branch behind the nest and flying from there to the nest. to me it didn't seem to be especially windy then. 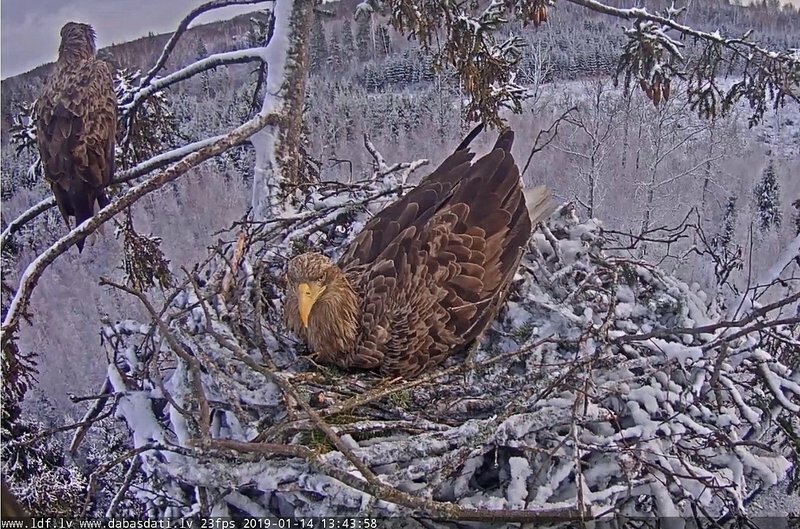 neither was it very windy when she made the unsuccessful landing on the back of the nest. i think that the probable reason for these cases was that on both times she had an exeptionally long and "bushy" stick, difficult to deliver. in the first time she managed to bring in the stick. on the second time she chose an unsuitable direction of approach. - in DDF there were also speculations about her health as the reason for these events (if i understood correct). that didn't even come to my mind yesterday. i don't believe there is anything to be worried about. 9:27 (nearly) she flew out. 9:22 she worked a little more... and looked around. 9:26 (almost 27) she flew away. nice to see you and thank you for your comments! we are never really out of season here. I do not think too that Milda has problems with health. The branch she had chosen an exotic, that's for sure! In the first case Milda too abruptly turned. Did not manage to calculate a trajectory. Not for nothing Raymis takes big detours with difficult sticks. Probably, all reasons in a complex affected. 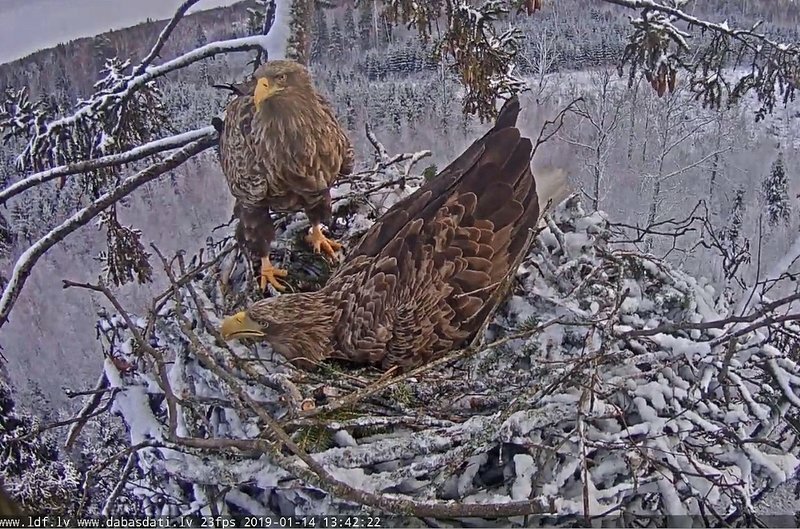 Eagles are always busy with something. Especially this couple.Do not rest and not give us.